The Victor Orchestra laying down some wax. While vinyl has long been one of the key identifying markers of the hipster, its increasing popularity, especially amongst non-hipster types, has rendered it toxic to anyone who takes being out of the mainstream seriously. With a return to CDs out of the question, that only left streaming, until Neil Young publicly derided it, which is tantamount to the Universe itself speaking. This weighed heavily on Pittsburgh über-hipster Marcus Siebel, who had already established a reputation as an avant-gardist when he turned his back on vintage clothing shops and even Urban Outfitters, choosing instead to make his own attire by assembling 1950s traveling salesman’s textile samples into patchwork overalls using a 19th century Singer sewing machine powered by foot pedal. It was whilst canning his homegrown vegetables that he thought of the method to maintain his music collection without succumbing to the massive corporate surrender that vinyl has come to represent – wax cylinder technology. Initially, recordings were hard to come, but by scouring neighborhoods densely populated by old people, he was able to amass a sizable collection, though they were usually of Italian tenors and hipster favorite, the original Victor Orchestra. 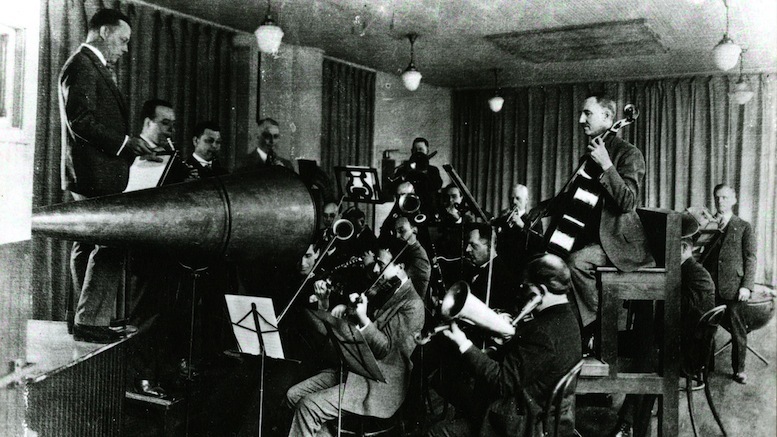 Though these were by no means offensive to his turbo-charged counterculture sensibilities, he wanted a more complete selection, so he learned how to transfer modern recordings to wax cylinder blanks using a flared horn. In this way he was able to add the entire back catalog of Arcade Fire to his aesthetically acceptable library, as well as the audio tracks for his favorite episodes of 80s TV black-comedy/medical-drama ‘St Elsewhere’, which, as every true hipster knows, is best enjoyed through the sound alone. Currently Marcus is looking to find a space that could accommodate his dream of a wax cylinder emporium with an inventory comparable in number to the vinyl inventory at Jerry’s Record in Squirrel Hill. Preliminary estimates in his business plan suggest a building the size of one and a half football fields is required. Investors wishing to partner with Marcus can find him most nights at the Arsenal Bowling lanes in Lawrenceville – just ask for the person who regularly rents bowling shoes but never bowls. Be the first to comment on "Pittsburgh Hipster Eschews Vinyl Record Collection For Wax Cylinders"